Learn to Code with a Full-Time Job - POCIT. Telling the stories and thoughts of people of color in tech. This is my first month learning officially how to code like a programmer. I was so excited that Flatiron School created the online Learn-Verified program because I loved the atmosphere of their in-person immersive courses but I knew there was no way I could take off three months to take their immersive course. You see, I am a middle school teacher and work around 60 hours a week. The online course provides everything from their Web Development Immersive program but it’s a self-paced course. An in-person immersive program usually takes 3 months to complete if you devote 40 hours a week or 6 months if you work on it part-time. 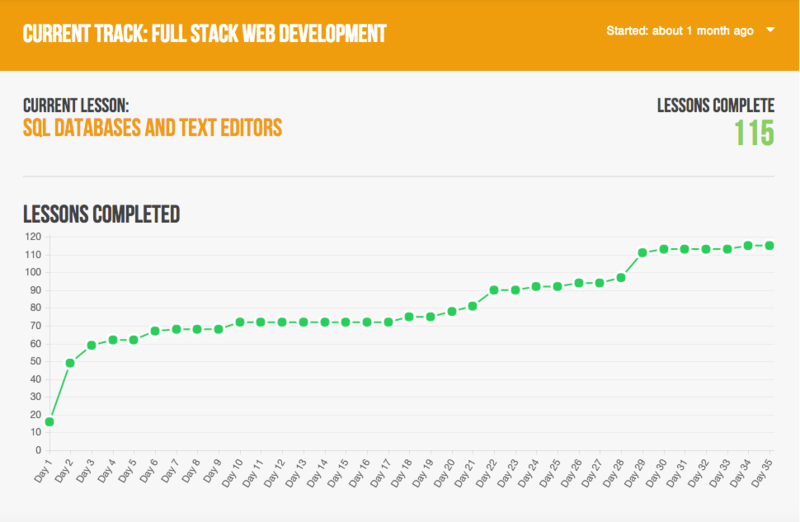 So far in the online Full Stack Web Development program on Learn, I have completed over 100 lessons in one month. Follow and do the “code along” even if it’s not mandatory. Taking the extra time to complete the “code along” and understand the lessons actually saved me the time when it came to completing the labs. All the labs (and the final projects) build off of each other. So, it saves times to understand the concept earlier than later. After completing the lab, check how everyone else completed it. I learned more from reading other people’s code than with just the code along. You can write better code and learn how to debug quicker if you practice this method, and it is a great way to meet other students in the community to chat. Commit to at least an hour a day. Programming is similar to exercising. When you miss a day, you feel like you moved five steps back. Anytime I feel frustrated or I truly don’t understand why my code is not working I always ask for help on the community chat. Asking for help means, you understand that you have a learning block that you want to remove. Take advantage of the lectures (or, at least, watch the videos). Learn’s Full Stack Web Development Program has live online lectures. Since I’m or working most of the time I usually watch the recordings. Every recording I watch I learn something new, either a tip from the instructor or a different way to write code. Either way, it’s useful and effective for completing my lessons efficiently. If you are learning how to code, please join me on my journey! If you want to learn how to code, check out Learn’s Full Stack Web Development Program and try their free, online pre-work first to get your foot in the door. Co-Founder and Blogger for POCiT. She is also piloting the first Computer Science curriculum as a teacher at Excellence Girls Middle Academy in Crown Heights. She was selected for the CS Educator Fellowship at the Flatiron School and is also a member of Teach For America-New York's Ambassadors Program.